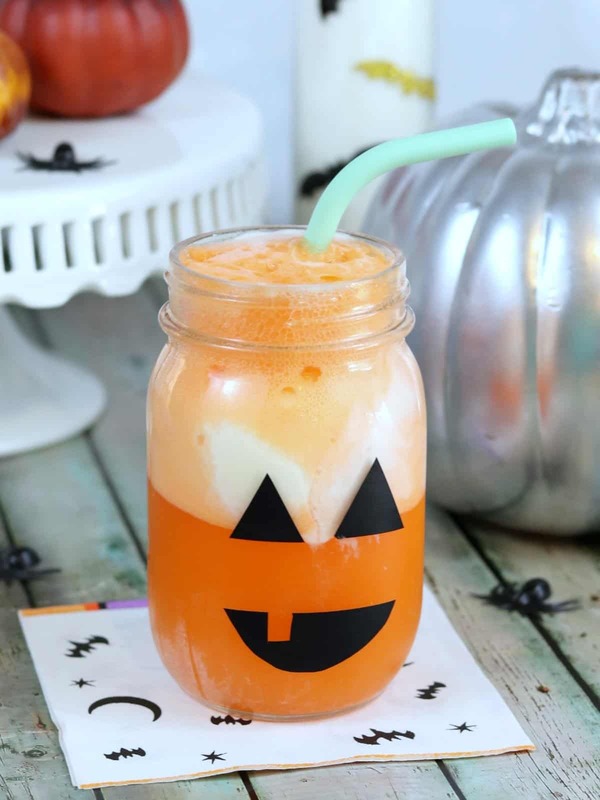 Today I am sharing a simple mason jar jack o lantern for Halloween as a part of a monthly mason jar challenge. We are in month 2, you can catch up and check out last month’s fall leaf mason jars. Can I tell you the best part about this mason jar project? I did it with Nora. I consider myself lucky to spend my afternoons with this little lady and we often craft and cook and go on adventures. She’s front and center in the video for this mason jar jack o lantern, be sure to check her out! You will also find some really cool Halloween jar crafts at the end of this post that you won’t want to miss. My girls and I love ice cream floats, especially with fun flavors like cream soda cherry or orange. 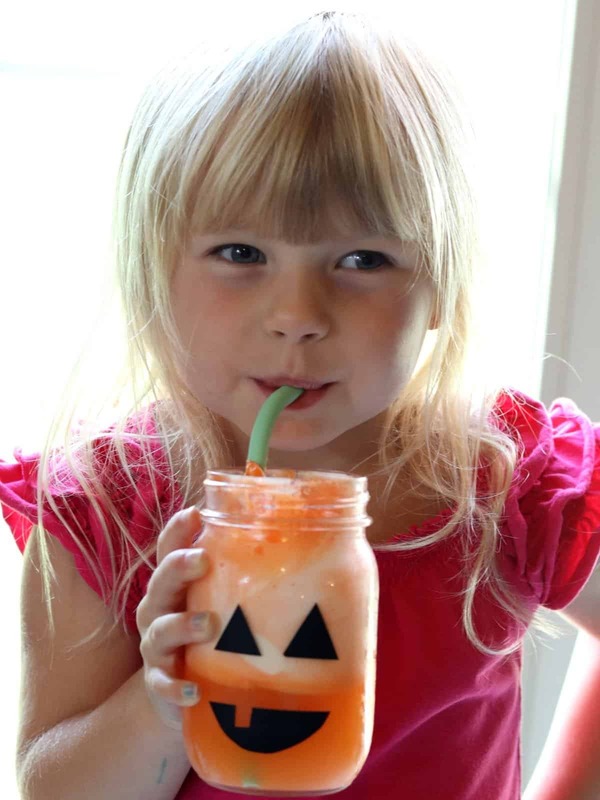 And what better way to enjoy an orange float for Halloween than in a jack o lantern jar. Nora and I made these jars with a scrap of black vinyl, this is my go to vinyl, and few simple supplies. Clean and wash the jars first so the vinyl will stick well. Use a ruler to take measurements for the jack o lantern face, then draw the parts of the face onto the back of the vinyl. Once the face is drawn simply cut out the pieces and stick them on the jar. This vinyl will hold up well to washing and repeated use, I like to hand wash them and avoid the dishwasher just to be safe. 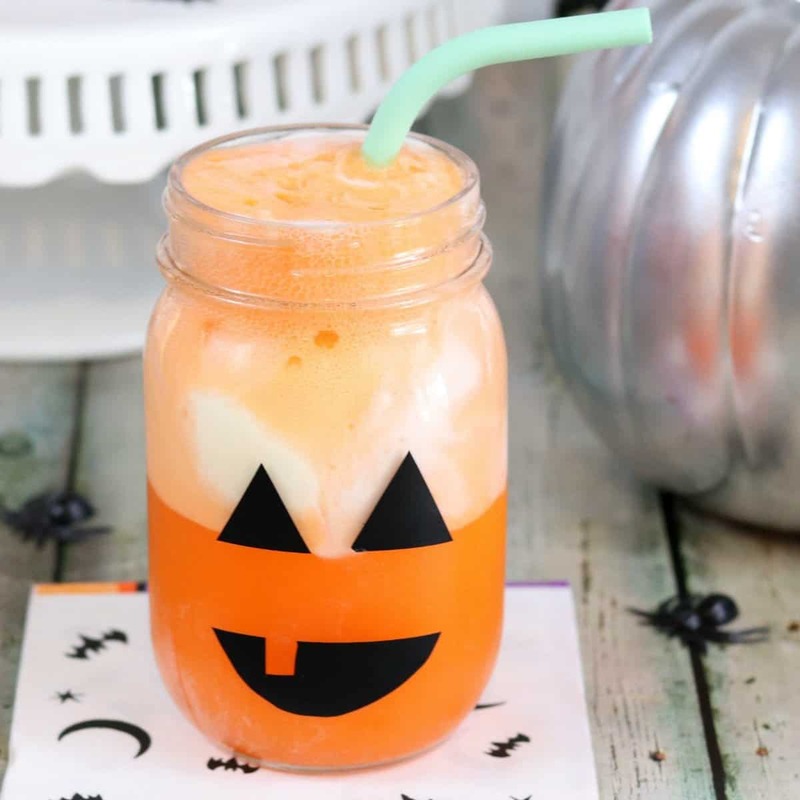 Fill the mason jar jack o lantern with vanilla ice cream and orange soda to make the perfect Halloween treat. This is such a simple project that any kid would love to make, and drink! These jars also make cute Halloween decorations filled with candy corn, flowers or a candle. If you like this project, be sure to pin it! 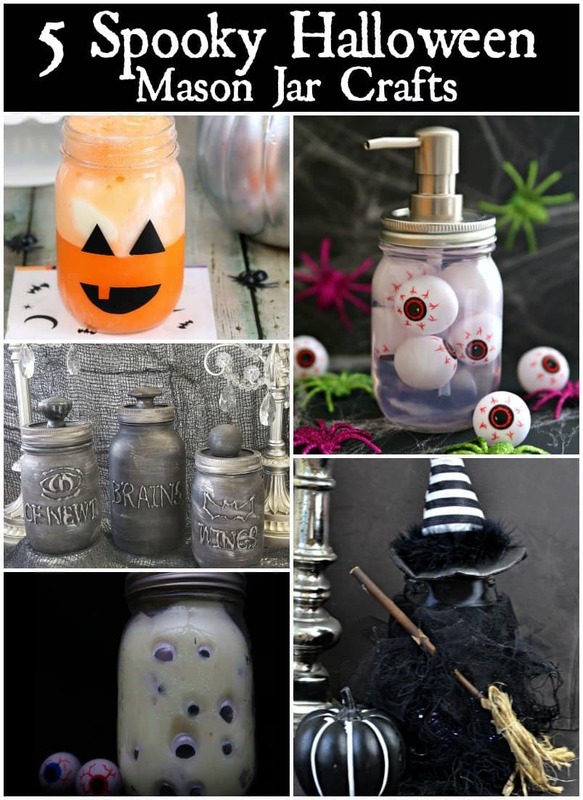 Check out these other spooky Halloween mason jar crafts. Nora looks like she is loving that float. Too cute. I love when your craft with your girls. These are so cute and so is Nora. What a fun time to make these together. I love orange floats. This is so cute and so is Nora. I love the orange float too. It is so fun to make crafts with kids. I did when my boys were little but when they got older they were done making crafts with mom. LOL! I love this.